Votes for best level 1 spell were pretty diverse, but Animate Skeleton was the clear winner. Worst level 1 spell was easier; most people picked either Corona, Sting, or Infusion. Blink got the most votes for best level 2 spell. I had no idea it was that popular. As you can see, most other people voted for Sticks to Snakes, which I did expect. The great thing about Slow and Corona is that even when they're worth casting, you'll hate that you're casting them. I never would have guessed that Regeneration would place so highly here. In contrast, absolutely anyone would have guessed that Gell's would "win" the title of worst level 3 spell. Maybe there are worse level 3 spells, maybe there aren't, but Gell's is the punchline for bad spell jokes. Early responses for best level 4 spell were almost 100% Summon Lightning Spire, but it diversified later. I've defended Leda's in the past as not being as bad as people think, but it's still probably worse than the other level 4 spells. BVC got the most votes for level 5 spell by a huge margin, which I fully expected (even though I disagree with it). 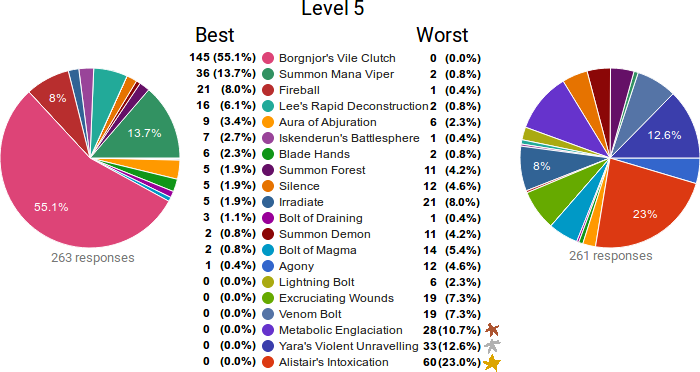 Agony got quite a few votes for worst level 5 spell. This is gonna be the one occasion where I make fun of your votes. If you voted for Agony as worst level 5 spell, you're silly and I'm making fun of you. I didn't have a guess for what the results of this one would be. There are so many weird level 6 spells. Malign Gateway was at like 70% for a while, but in the last few days of the poll it plunged. Another "worst" result that anyone could guess. This is extra funny if you know that Ring of Flames used to be level 8. I expected Borgnjor's to get the most votes for "best" here. I was very wrong. Man, level 8 has a lot of bad spells. This one is interesting because Shatter had a big lead in the early responses (even excluding mine), but Fire Storm crushed it in the final results. Tornado managed to occupy almost the exact same space in both the best and worst charts, somehow. Sort of paralleled the best level 9 spell results; Earth was winning at first but then Fire came from behind and overtook it. I expected either Ice or Fire to get the most votes for "worst" here, though I wasn't sure which. Didn't see this coming. I do personally think Ice is better than Air though. I think that I won't include these questions in the next iteration of the poll, if there is one, as elemental school balance has been steadily improving. There's also a single image version of the results if you want that. I think this poll suffered from the way I divided spells. Compared to a single-school spell, a multi-school spell of the same level is harder to cast, which inherently makes it worse - so it probably shouldn't be in the same category. Spells that can be used out of combat, like Animate Dead, Deflect Missiles, and self-enchantments in general, are a similar issue. I intentionally left the meaning of "useful" vague, because I didn't want my own ideas about spell strength to influence the results (aside from my 1 vote in each question obviously). But as nago pointed out in the original thread, this does have its issues - some spells are much more useful in "turncount runs" compared to "winrate runs", such as Regeneration and Statue Form. Dividing spells by level was intended to minimize the contest between "early game" and "late game", but some low-level spells remain useful for much longer than others. And some spells are useful for a greater variety of characters than others. If I do something like this again next year, I should devise a different scheme to divide up spells, ideally one that produces fewer than 9 categories. Randomizing the order of the questions would help with bias but it would also make the poll a lot less convenient to answer. It is trivial to pollute a poll like this with bogus responses, but I didn't see any obvious foul play, which was a pleasant surprise. That said, please don't use these results to inform your own beliefs about how good a spell is! You should always evaluate such things for yourself. The spell schools to have no spells winning a "best" poll were Charms, Hexes, and Ice Magic. The spell schools to have no spells winning a "worst" poll were Air Magic, Conjurations, Ice Magic, and Necromancy. Clearly, this proves that Ice Magic is the most balanced spell school. Last edited by duvessa on Tuesday, 1st January 2019, 18:54, edited 2 times in total. I am not sure about others but I picked spells based on assumptions that I find them in Lair or later and looked at average picture meaning my character can be anything from TrMo to DEWz. If other players used similar approach, it explains why Hexes were not selected as the best spells in level 2(EH), 3(Confusion) and 6(Invis). The first two depend on spellpower too much and all of them require a particular playstyle (short blades and light armour). Sticks to Snakes is listed twice in "level 2" section with different "best" values. 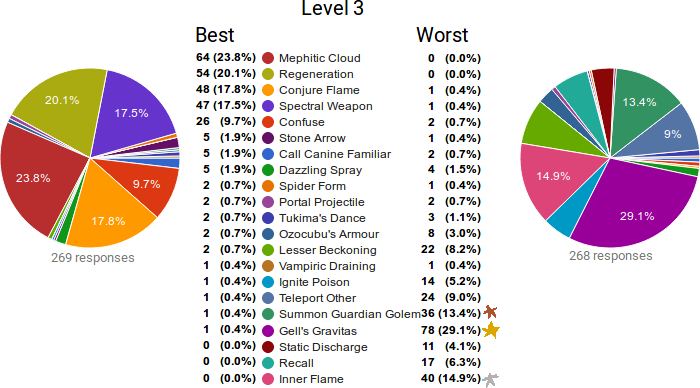 Thanks for hosting the poll, lvl 6 results are truly a mess for both best and worst. Invisibility doesnt need short blades and light armor at all. With short blades it is incredible. Without short blades it is still amazing. And if you plan on getting mana viper, which most characters would benefit from, you are halfway there. Only "downside" of invisibility is that you can get it cheaper from evocables so it can become "wasted" xp. Svankensen wrote: Invisibility doesnt need short blades and light armor at all. With short blades it is incredible. Without short blades it is still amazing. And if you plan on getting mana viper, which most characters would benefit from, you are halfway there. Only "downside" of invisibility is that you can get it cheaper from evocables so it can become "wasted" xp. In my experience invisibility is not great in non-light armor and with non-short blades, certainly not in "the best for its level" league. First it takes ages to come online and then you do pathetic damage because everyone is waken up and is not one-shoted even if you somehow managed to attack it while it was sleeping. Nice poll. Not too many real surprises to me, other than so many people think Yara's is a bad spell. If you run this again, I might suggest having up to three choices for best/worst spells in each level? With the order not mattering, and instructions that you don't have to make three choices and should leave some blank if you think that e.g. s2s and blink are far better than other level two spells. A lot of my choices ended up being kind of a toss-up between a few spells, and I don't think I even remember what I picked for a few of them. I guess that someone was clearly trolling in the voting. Corona, Gell's Gravitas and Ring of Flames all got a vote for being the best spell in their category. The most interesting thing in the evaluation: Duvessa/Minmay thinks that LRD is better than Vile Clutch. Yeah, LRD is not bad, but come on. because I never used them. Stairdancer wrote: Sticks to Snakes is listed twice in "level 2" section with different "best" values. Magipi wrote: I guess that someone was clearly trolling in the voting. Corona, Gell's Gravitas and Ring of Flames all got a vote for being the best spell in their category. Whenever I saw a suspicious vote like this I investigated the full response, and all of them appeared to be genuine. Those three votes came from three different responses made at three different times. VeryAngryFelid wrote: In my experience invisibility is not great in non-light armor and with non-short blades, certainly not in "the best for its level" league. First it takes ages to come online and then you do pathetic damage because everyone is waken up and is not one-shoted even if you somehow managed to attack it while it was sleeping. That is because you are trying to use it offensively. Defensively it is still excellent. Magipi wrote: The most interesting thing in the evaluation: Duvessa/Minmay thinks that LRD is better than Vile Clutch. Yeah, LRD is not bad, but come on. I really wanted to vote for LRD there too. I simply love the spell. Very strong, single school, AoE, whole screen range, usefull until depths. You can totally build your character around that single spell when playing EE. But ever since BVC apeared, my EE's have defaulted to BVC once they find it. A shame. BVC is also a spell that makes two of the strongest magic schools stronger. Make it transmutation/poison, I say. Constricting vines or something. I think that Agony and Summon Mana Viper are definitely better than BVC as well. Nowadays it is just a damage spell that you cannot even use in half of the situations. I wonder how many people who picked LRD as best spell knew those facts. EH/Confuse does zero damage and is still better than LRD despite being lower level and here we are talking about mass version of EH/Confuse which also does some decent damage as a bonus, and the damage is not one time only but can last several turns from a single cast. I prefer fire storm as it works on 100% levels. LRD is too situational. I think LRD recently got changed not to affect out-of-LOS enemies. I was annoyed because before that LRD was one of my favourite spells. No, it got changed to not affect enemies that are on the "other side" of a wall. It still hits monsters that are out of LOS. Can you elaborate on how you would use this? Do you just spam it every turn on a corner and hope they walk into it before you run out of mana? Or is this just for Ash/other-people-with-warning? Or do you rely on having enough stealth they don't notice you when they enter LOS? You're on stairs. You would like to stay on the stairs, but you would also like to kill monsters. Some of the monsters on the level are wandering, but most of them are asleep. So you start by firing launchers at the edge of LOS to wake up and attract the closest monsters. Then you use LRD at the edge of LOS to wake up and attract the monsters that are further away. You don't need to spam it every turn. I stand corrected. LRD does damage targets outside of LOS, but the interface makes it look like it can't. See this example below: the middle of the cage is not highlighted, which made me think it can't be damaged. The monster in the cage was killed however. Interesting responses, well done. I would have voted for LRD if it hadn't lost its mini-shatter. As such, I believe I went with Mana Viper. Some responses surprise me, others not so much. I suspect the reason things like regeneration are popular is consistent utility w/o much opportunity cost. Prior to entering a fight, you're not losing much to cast regeneration for example, it just makes you a bit safer and saves some time healing. I agree these types of spells should probably be stratified from damaging spells. Even more so in the lower spell levels where the investment to use them is minimal. I simply don't get how things like Ozocubu's armor can be rated lower than inner flame or gravitas though. duvessa wrote: I never would have guessed that Regeneration would place so highly here. This is not surprising to me, but dialogue is different on tavern than other places. Regeneration is a spell that lots of people like to get because it makes you at least feel a lot safer to have a form of healing. It's a spell people talk about hybridizing for in places like the something awful crawl thread, for example. only came across this after it was finished, but was pleasantly surprised to see statue form #1 and regeneration a close second for their levels. Definitely agree that LRD is very powerful; if I'm on a strong character and just blasting through rooms easily I won't be setting it up as much, but then I don't have to. When you're in a tough spot, the first response is always to run to a chokepoint/hallway, and then the monsters are naturally funneled to where you can hit 3 (straight hallway) or 4/5 (if around a corner) which is just absurdly strong. It's only real weakness is that you tend to get it online/rely on it right when you're hitting the lair, and the lair layouts are pretty hard to abuse it in, due to a lack of hallways. That said, there's usually still enough terrain around to blast 2-3 mobs if you really try. As far as overall schools I'd go earth best, air worst, but really I consider fire/earth/ice to all be good, and only really don't like air. Tornado is probably the most efficient level 9 spell, but even though it does the most damage per cast, since it is bad at "make things dead right now this turn I mean let's go already", I can see why people would rate it lower. I'm just not much of a fan of lower level air spells, hence why I consider it the worst school. In the future though, I'd probably consider putting conjurations up against the elemental schools. It's a bit of an apples to oranges comparison, but I'd take pure conjuration spells over any of the elemental spell schools, although it may be more of a tie with earth. IMB does serious work and as a single school level 4 nuke, it doesn't take long to get online either. I'm a bit surprised that it's IMB you mention at level 4 for conjuration; Fulminant Prism is the real Cj powerhouse at that level as far as I can tell. It's at least as much damage as IMB, in a bigger area, and can kill things out of LOS. I know it's dual-skill, but... it's so much better than IMB 90% of the time. tasonir wrote: In the future though, I'd probably consider putting conjurations up against the elemental schools. The point to comparing the four elemental schools is that there is almost no overlap between them. The only two spells with multiple elemental schools are Bolt of Magma, a spell almost universally recognized as crap, and Freezing Cloud, a spell that is barely affected by elemental school choice (since it's triple-school and spell power does basically nothing for it). Meanwhile, about 60% of conjurations have an elemental school on them, and about 50% of elemental spells have the Conjurations school. No other school has this much overlap with elemental schools; Conjurations is the worst possible additional school to add to this question. A poll that compares all the schools could be interesting, though. I'd be vaguely interested in a poll for the worst/best in spell school. Siegurt wrote: I'd be vaguely interested in a poll for the worst/best in spell school. Indeed. It is almost meaningless IMHO. A character who is going to learn just level 2-3 spells will have one answer for "which school is the best", character with level 6 spells will have another answer and character who is going for level 9 spell(s) will have third answer. Also I am not sure how we can compare a school with average spells to a school with some weak and some overpowered spells. Will you ignore weak spells in comparison because you are not going to use them anyway? But we aren't polling *characters* we're polling *players* I assume most people who would respond have at least played enough to get an idea of what they do/don't like throughout a spell school regardless of how useful a spell is for an individual character, I mean blink is obviously completely useless for a formacid, but I don't think blink would get a lot of votes for 'worst spell' just because someone played a formacid recently. Siegurt wrote: But we aren't polling *characters* we're polling *players* I assume most people who would respond have at least played enough to get an idea of what they do/don't like throughout a spell school regardless of how useful a spell is for an individual character, I mean blink is obviously completely useless for a formacid, but I don't think blink would get a lot of votes for 'worst spell' just because someone played a formacid recently. As a player I have experience of playing different characters so I would not be able to choose the best spell unless the poll indicated something like "assume you are playing MiGl" or "assume you are playing DEWz" because those 2 characters give completely different view on the best spells. byrel wrote: I'm a bit surprised that it's IMB you mention at level 4 for conjuration; Fulminant Prism is the real Cj powerhouse at that level as far as I can tell. It's at least as much damage as IMB, in a bigger area, and can kill things out of LOS. I know it's dual-skill, but... it's so much better than IMB 90% of the time. This seems entirely fair to me, the answer is just that I'm lazy and IMB works well enough that I haven't bothered to set up mines and walk backwards. I'm fairly sure you're correct that it's a lot better to use prism, I just tend to move on to either iron shot or melee build hybridization. User interface and being able to macro your attack to just pressing "1" until the monsters are dead is the main reason for IMB.